An injury time goal from John Breen earned Ferns St Aidans a dramatic victory over Kilmore in their Ashdown Park/Amber Springs Hotels Intermediate Football Championship Group B clash at Farmleigh on Sunday. Kilmore looked to have done enough to claim the points as the clock ticked into time added on, but when an Ivan Meegan effort at an equalising point fell short, Breen showed a real poacher’s instinct to fist the ball to the back of the net. It was hard on Kilmore, as when they were in the ascendancy midway through the second half they shot some poor wides and were guilty of trying to walk the ball into the net when straightforward points were there for the taking. However, Ferns also enjoyed periods of dominance, none more so than in the early exchanges, as they raced into a three-point advantage in the opening eight minutes. Patrick Breen got the ball rolling on the two-minute mark, Ryan Nolan followed suit 60 seconds later, and Breen again found the range as they began with a real swagger. Kilmore had to wait until the eleventh minute for their opener, when Liam Shannon squeezed the ball over from an acute angle. Ferns St Aidans led by 0-6 to 0-3 by the 24th minute with John Breen, Ryan Nolan and Patrick Breen adding to their tally, and points from Aaron Goff and Paddy Byrne keeping the Wexford District men within striking distance. Kilmore finished the half strongly though, and Byrne rifled over a booming effort, before Shane Goff scored two points in quick succession to leave it all square at the break. When goalkeeper Kevin Casey struck a 45 over the bar in the 35th minute, Kilmore were ahead for the first time – a lead they would hold until injury time. Robert Cousins split the posts with a fine effort in the 43rd minute and moments later, Noel Casey saw his shot well saved by Ferns goalkeeper, Jason Maguire. Patrick Breen and Shane Goff swapped points and with just two minutes left, Ryan Nolan put the minimum between them, paving the way for a grandstand finish courtesy of Breen’s goal. Ferns St Aidans: Jason Maguire; Brian O’Neill, Pádraig Bolger, Declan Byrne; Keith Breen, Colm Whelan, Aaron Collier; Peter Codd, Ciarán Roberts; Ian Byrne, Tomás Hawkins, John Breen (1-1); Ryan Nolan (0-3), Patrick Breen (0-4), Robert Vickers. Subs: Peter Nolan for Hawkins; Ivan Meegan for Codd. Kilmore: Kevin Casey (0-1, ‘45’); Peter Shannon, Stevie Cousins, Martin Frayne; William Carley, Denis Kenny, Rory Cardiff; Noel Casey, Paddy Byrne (0-2); Aaron Kielthy, Shane Goff (0-3), David Murphy; Aaron Goff (0-1), Robert Cousins (0-1), Liam Shannon (0-1). Subs: Derek Miskella for A. Goff (temp); Nathan Bates for A. Goff. Referee: James Flood (St Mary’s, Maudlintown). 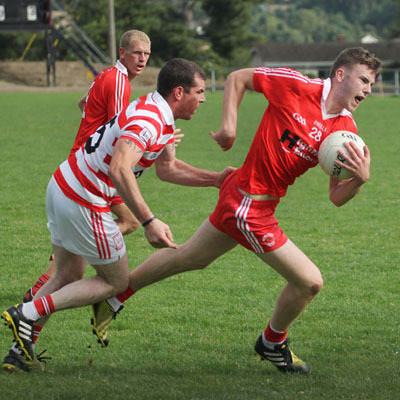 St Fintan’s again illustrated their championship credentials as they comfortably outscored Ferns St Aidans in their Ashdown Park/Amber Springs Hotels Intermediate Football Championship Group B match in Oylegate on Saturday. Both sides had won their opening games, albeit in contrasting fashion, so something had to give and from an early stage it was obvious that the Ballymore men held all the aces. 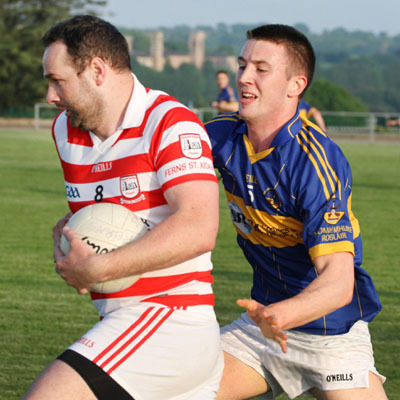 St Fintan’s, who exited the senior ranks last season, look well equipped to mount a serious challenge for intermediate honours again, but much stiffer tests will lie ahead than what they faced on Saturday. The ease of the victory was even greater than the scoreline would suggest, with a late goal from substitute Paul Morris a mere consolation for Ferns after St Fintan’s had pulled away at a canter in the second half. The Wexford District side made almost all the early running and were 0-6 to 0-1 to the good by the 17th minute, with Shane Sinnott opening the scoring after just 20 seconds and Conor Sinnott (two), Donal Shanley (two frees) and Cathal O’Brien (free) following suit, while a long range Patrick Breen placed ball was all Ferns had to show for their early exertions. Ferns did get the scoreboard moving with the next two points, as Ryan Nolan and Aaron Collier split the posts, but Donal Shanley popped over his first point from play to give St Fintan’s a 0-7 to 0-3 half time advantage. After Kevin Day and Colm Whelan exchanged points from play early in the second half, it was pretty much one-way traffic as St Fintan’s assumed complete control. Cathal O’Brien, who was a potent target man in the inside forward line, swivelled and rifled the ball over the bar, with a long-range Conor Sinnott free and points from Joey Wadding, Donal Shanley, and Sinnott again giving St Fintan’s a commanding 0-13 to 0-4 advantage. A good left-footed Paul Morris point stopped the rot for Ferns on 55 minutes, but it was cancelled out by Cathal O’Brien within 60 seconds. St Fintan’s suffered a couple of late blows, with Paul Morris palming an Ivan Meegan pass to the net and Joey Wadding being dismissed on a second yellow, but it will have done little to dampen their spirits. Ferns St Aidans: Jason Maguire; Brian O’Neill, James Tonks, Declan Byrne; Keith Breen, Pádraig Bolger, Aaron Collier (0-1); Tommy Dwyer, Colm Whelan (0-1); Robert Vickers, Ciarán Roberts, Peter Nolan; Tomás Hawkins, Patrick Breen (0-1 free), Ryan Nolan (0-1). Subs: Ivan Meegan for Roberts; Ian Byrne for Whelan; Paul Morris (1-1) for Hawkins; Jonathan Dwyer for P.Noaln; Christopher O’Connor for Dwyer; John Breen for K. Breen. St Fintan’s: Patrick McDonnell; Adrian Murphy, Frank Staples, Peter Goldsmith; Jim Rossiter, Kevin Day (0-1), Brendan Hughes; Joey Wadding (0-1), Pádraig Doyle; Jack Pettit, Donal Shanley (0-4, 2 frees), Shane Sinnott (0-1); Conor Sinnott (0-4, 1 fre), Cathal O’Brien (0-3, 1 free), Jason Pettit. Subs: Fintan Mullins for Doyle; Robert Coakley for Day; Eoin Cummins for Jason Pettit. Naomhan Rossiter struck an equalising goal with just a minute remaining to give his St. Mary's (Rosslare) side their first point of the Ashdown Park/Amber Springs Hotels Intermediate football championship Group B in St. Patrick's Park, Enniscorthy, on Wednesday. With time ticking away on their championship aspirations, the county newbie hauled in David Murphy's free-kick into the goalmouth, made a yard of space just inside the large rectangle, and struck a powerful shot low through a raft of bodies to the Ferns net. On the balance of play after the interval, Rosslare were a little fortunate to snag a draw. They were under the cosh for spells but defended resolutely. However, they also felt aggrieved at full-time, having been adamant that a David Murphy attempt that was waved wide in the second-half had gone inside the post. Not looking one hundred per cent, Murphy played as the furthest man forward and grew into the role the longer the game went on. Yet, it was another Rosslare man familiar with the county set-up, Tiarnan Rossiter, who kicked a fine opening point from the left wing. A pair of classy points by Tommy Dwyer and Patrick Breen gave Ferns a lead at the end of the opening quarter, but quickfire scores from Murphy and a booming Niall Walsh minor left St. Mary's 0-3 to 0-2 ahead. With two minutes of the period remaining, Stephen Cogley was penalised for a foul on Christopher O'Connor, under a hopeful dropping Ryan Nolan ball, for a penalty that Nolan himself converted. It was enough for a 1-2 to 0-4 interval lead for Ferns after David Murphy's late point. Following an exchange of points between Murphy and John Breen, Tiarnan Rossiter won possession back high up the field, ran at the Ferns defence and off-loaded to Lee Devereux who smashed a powerful shot past McGuire. The goal came as the Gorey District side dominated the ball without a cutting edge, that was until Robert Vickers was introduced. He won a free that O'Connor converted before he dribbled past two defenders soccer-style and side-footed to the Rosslare net in the 50th minute (2-5 to 1-6). A Vickers point edged the lead up to three but there was still time for Naomhan Rossiter to score a dramatic late equalising goal to keep his side's hopes of reaching the last eight alive with two games still to go. Ferns St. Aidans: Jason McGuire; Declan Byrne, Pádraig Bolger, Brian O'Neill; Peter Nolan, Ciarán Roberts, Keith Breen; Colm Whelan (capt. ), Ian Byrne; Ryan Nolan (1-1, 1-0 pen. ), John Breen (0-1), Tommy Dwyer (0-1); Aaron Collier, Patrick Breen (0-1), Christopher O'Connor (0-1 free). Subs. - Robert Vickers (1-1) for Collier (43), Peter Codd for P. Nolan (49), Ivan Meegan for Whelan (54). St. Mary's (Rosslare): Stephen Cogley; Gearóid Byrne, Emmett Byrne, Conal Grant; Seán Finan, Naomhan Rossiter (1-0), Tiarnan Rossiter (0-1); Andrew Murphy, Robert Butler; Larry Morrissey, Lee Devereux (1-0), Niall Walsh (0-1); Ultan Quirke, David Murphy (capt., 0-4, 3 frees), Barry Quirke. Subs. - Peter Carr for Morrissey, inj. (18), Mick McInerney for A. Murphy, temp. (23-25), Paul Kinsella for Grant, inj. (31). HWH-Bunclody withstood a late onslaught from Ferns St. Aidan's to make it three wins from four in Group B of the Ashdown Park/Amber Springs Hotels Intermediate football championship in Bellefield on Saturday. When Keith O'Hara grabbed a goal with twelve minutes remaining, turning in an opportunistic effort from close range, Bunclody looked to have the points in the bag but Ferns rallied to get back within striking distance. However, try as they might, and despite a few frantic moments for the Bunclody defence, they couldn't force a late equalising goal. HWH-Bunclody had slightly the better of a tepid first-half, and went in with a 0-6 to 0-3 advantage at the interval, with Keith O'Hara, Colm Farrell and Josh Martin finding the range and Ryan Nolan (two frees) and Conor Nolan replying for Ferns as the sides were deadlocked at 0-3 apiece on 18 minutes. The eventual winners managed to put a bit of daylight between themselves and their opponents in the last ten minutes of the half though, with Seán Kenny edging them in front and Kevin Dunne adding two frees. Ferns weren't long about wiping out that lead, however, with John Breen firing the ball to the back of the net on 33 minutes after good work in the build-up by Ivan Meegan. There was no panic in the Bunclody ranks though and they built up a five-point advantage by the 49th minute, with substitute Peter Atkinson and Keith O'Hara picking off points, and the latter then pouncing for a most important goal. Kevin Dunne blasted in a shot from the right and O'Hara applied a touch to steer the ball beyond goalkeeper Jason Maguire and give his side a 1-8 to 1-3 lead. Back came Ferns though and Ryan Nolan had them right back in the tie when he confidently strode forward and buried the ball in the far corner of the net on 54 minutes. Points from Peter Atkinson and Kevin Dunne (free) calmed the Bunclody nerves slightly, but when Patrick Breen fisted a floated Ryan Nolan free over the bar with the watch reading 59 minutes the gap was back to a single score. Ferns threw everything at Bunclody for the remaining minutes but they held firm to leave themselves sitting pretty at the top of the table. Ferns St. Aidans: Jason Maguire; Niall Maguire, Declan Byrne, Brian O'Neill; Robert Vickers, Colm Whelan, Keith Breen; John Breen (1-0), Ian Byrne; Ivan Meegan, Tommy Dwyer, Patrick Breen (0-1); Ryan Nolan (1-2, 0-2 frees), Peter Codd, Conor Nolan (0-1). Subs. - Jamie Whelan for Byrne (temp. ), Whelan for C. Nolan, Frank Devereux for N. Maguire. HWH-Bunclody: Patrick Kavanagh; Billy Kelly, John Atkinson, Enda Slevin; Martin O'Connor, James Moorhead, Páuric Sinnott; Bryan O'Hara, Conor Kinsella; Colm Farrell (0-1), Keith O'Hara (1-2), Josh Martin (0-1); Eoin Kelly, Seán Kenny (0-1), Kevin Dunne (0-3 frees). Subs. - Peter Atkinson (0-2) for Martin, Barry Kehoe for B. O'Hara. St. Mary's (Maudlintown) will head into the quarter-finals with a quiet confidence after a routine win over Ferns St. Aidan's in St. Patrick's Park on Saturday made it four wins out of five in Group B of the Ashdown Park/Amber Springs Hotels Intermediate football championship. Their opponents also scraped through to the last eight after amassing three points from their five games, with only scoring difference separating themselves and St. Mary's (Rosslare). Dermot Flood and Richie Kehoe did most of the damage for the Wexford town side, but they have a nice balance throughout the team and have a host of players capable of picking off scores. St. Mary's were 0-3 to 0-2 to the good when Flood grabbed the opening goal in fortuitous fashion, with his '45 deceiving goalkeeper Jason Maguire and ending up in the back of the net. However, Ferns were back on level terms within five minutes, when a Paul Morris free was quickly followed by a John Breen goal. Jonny Dwyer's attempt at a point was held up by the strong breeze and Breen gathered possession, before calmly slotting the ball over the line. Richie Kehoe and Pierce Dooley then notched good points either side of a Ryan Nolan free, before Kehoe had the green flag waving again. The busy full-forward gathered a long delivery from Ross Lynch, before unleashing a powerful shot to the corner of the net. St. Mary's held a 2-6 to 1-5 lead at the break and they stretched the advantage to nine points by landing five on the trot after the re-start, with Donal O'Leary (two), Jason Swords, Ross Lynch and Richie Kehoe all doing the needful. Two minutes after entering the fray Ben Cowman gave Ferns a grain of hope in the 47th minute when he bundled the ball over the line to get them back within six (2-11 to 2-5). However, that six-point gap remained at the final whistle, with Willie Lambert, Dermot Flood and Jason Swords splitting the posts for St. Mary's and Paul Morris, Peter Nolan and Patrick Breen replying for Ferns. St. Mary's will now play Taghmon-Camross. Ferns St. Aidans: Ivan Meegan; Niall Maguire, Pádraig Bolger, Brian O'Neill; Peter Nolan (0-1), Declan Byrne, Keith Breen; John Breen (1-0), Colm Whelan; Jonathan Dwyer, Tommy Dwyer, Aaron Collier; Patrick Breen (0-1), Paul Morris (0-3, 2 frees), Ryan Nolan (0-3 frees). Subs. - Ciarán Roberts for O'Neill, Ben Cowman (1-0) for J. Dwyer. St. Mary's: Paul Dempsey; Alan Lynch, Roy Doyle, Mark Doyle; Gavin Cullen (0-1), Alex Lynch, Gary Murphy; Graham Carty, Donal O'Leary (0-2); Ross Lynch (0-1), Martin O'Connor, Jason Swords (0-2); Dermot Flood (1-4, 1-0 '45), Richie Kehoe (1-2), Pierce Dooley (0-1). Subs. - Willie Lambert (0-1) for Dooley, Eddie Pitman for Cullen. Referee: John Tobin (Geraldine O'Hanrahans). The gleeful footballers of Ferns showed how it was possible to score two points in the second half and still progress to the semi-finals of the IFC. They left 14-man Kilanerin aggrieved with the decision of referee Brendan Martin to send off substitute Peter Hughes shortly after his introduction at corner forward. But the losers would do better to look at how they managed to extract just seven points from a match in which they held the upper hand for long periods. The Saturday afternoon fixture at St Patrick's Park commenced in sunshine and Ferns with their fluid formation promptly looked set to make hay. Initial efforts were wayward but then John Breen started the ball rolling with a couple of very stylishly kicked points following by a free. Kilanerin's early tactics appeared to be based around soaking up pressure and then find Matty Forde on the break with Dean O'Toole running himself to exhaustion providing ball for the great man. Unfortunately, the former All-Star's shooting boots were off-key as Forde struck a series of wides, plus one tame effort straight at goalie Ivan Meegan. When he returned the compliment with a nice pass to tee up O'Toole, his sidekick had his attempt on goal superbly saved by Meegan. As a result, it was 23 minutes before the north county side registered their first score when their talismanic number 14 used his height to collect the ball and kick over the bar. As the sun turned to rain and the wind freshened, the slow start (0-2 to 0-7 behind at the interval) looked anything but fatal to their cause. With Paul Morris directing affairs, Ferns resumed happy to play possession football rather than look to extend a lead that soon looked far short of being a commanding advantage. Forde took a pass from Bobby Hughes to close the gap to four and he had the Kilanerin supporters applauding as he knocked over another point from the right before popping up on the left to repeat the dose. Then, on 41 minutes came the sending off just as Forde was poised to go for goal. Ferns defender Niall Maguire went down in a mysterious heap and the ref reached for the red after his umpire identified Peter Hughes as the off-the-ball culprit. The effect of being short-handed was not immediately obvious as Kilanerin continued to press towards the goal at the dressing room end of the field. Matty Forde's free, swung high over Meegan's bar with a lazy swing of his right leg reduced the gap between the teams to the minimum on 46 minutes. That, however, was as close as they came, with Ferns resuming their point gathering after more than a quarter hour in which their total remained stuck on seven points. Veteran Edward Cullen stabbed the ball over to end the worrying drought and the same player was called upon to add a free kicked from off the ground on 59 minutes. All Kilanerin could muster in reply was a delightfully struck point from Bobby Hughes before the final whistle sounded, greeted with something close to disbelief by the Ferns players and faithful. The instinct of the defeated side was to turn on referee Martin who added to the collective misery with a red card issued to Forde for his abusive language as the season ended on a sour note for one of Wexford's finest ever footballers. Ferns St Aidans: Ivan Meegan; Brian O'Neill, Padraig Bolger, Niall Maguire; Keith Breen, Declan Byrne, Colm Whelan; Thomas Hawkins, Tommy Dwyer (0-1); Patrick Breen (0-1), Peter Nolan, Paul Morris (0-2); Edward Cullen (0-2, 1 free), Ryan Nolan, John Breen (0-3, 1 free). Kilanerin: Tom Hughes; Aidan Jones, Colm Kavanagh, Brian Hughes; Killian O'Toole, Richard Hughes, Gavin O'Toole; Jim Hughes, Niall Hughes; Mark Boland, Mark Gethings, Bobbly Hughes (0-1); Dean O'Toole, Matty Forde (0-5, 1 free), Denis Jones. Subs: Peter Hughes for D O'Toole 36 minutes; Tommy Boland for J Hughes 41; Lorcan Clare for K O'Toole 48 minutes. Unfancied Ferns St. Aidan's came within a whisker of forging a shock victory in Innovate Wexford Park on Saturday when they shared the spoils with a malfunctioning Taghmon-Camross side in a low-scoring Ashdown Park/Amber Springs Hotels Intermediate football championship semi-final. There was high drama over five minutes into added time with the sides deadlocked when Ferns substitute Robert Vickers palmed the ball on to John Breen slightly to the right of goal at the Clonard end. It's easy to be wise from the stand of course, but I felt the best option was to try for a fisted point. However, the midfielder put his boot to the ball and it lacked elevation and power, eventually ending up in the arms of netminder Seán O'Gorman before the final whistle blew and Taghmon-Camross breathed a collective sigh of relief. Both teams have hurling commitments next weekend, so one would expect the Taghmon-Camross mentors to ask themselves a key question in the fortnight before the replay: is their gameplan bringing the best out of their highly-rated forwards? My own opinion is a resounding 'no', because their talented scoring attackers were denied space and support by the insistence on having at least two extra defenders at any given time. The frustration of their followers in the stand was summed up by one who, after urging his team to push up in the second-half, added the witty but accurate comment: 'it's not f***ing Dublin we're playing'! Ferns make no secret of their preference for hurling, but they were more than a match for the favourites even after losing Tomás Hawkins to a straight red card in the 52nd minute. However, the loss of free-taker Ryan Nolan with an apparent hamstring injury earlier was the last thing they needed with a depleted squad already for next weekend's Pettitt's Senior hurling semi-final against Oulart-The Ballagh. Their main man was Paul Morris who exuded control on the ball, playing the game at his own pace and repeatedly making excellent use of possession. One might argue that those aforementioned Taghmon-Camross forwards need a drier day to show their true worth, and the wind and rain played into the hands of the less polished Ferns outfit. However, you take what you get weather-wise at this time of year, and more often than not it's bad rather than good. Just seven scores were recorded in the first-half, with the sides level three times before a Ryan Nolan free in the 28th minute left Ferns with an interval lead of 0-4 to 0-3. Eoin Doyle had opened the Taghmon-Camross account inside three minutes, with Patrick Breen levelling for the Gorey District side who were ahead 8-3 on the wides count by the break. Jonny Dwyer played a one-two with Tommy Dwyer to edge them in front in the ninth minute, but Stephen O'Gorman hit back with the outside of his boot from an Ian Carty pass. Tommy Dwyer made it 0-3 to 0-2 and then saw his goal chance saved when he was forced on to his weaker right foot. Páuric O'Gorman brought the teams together for the third time in the 22nd minute, and Seán O'Gorman had to make a good save from John Breen before Ryan Nolan restored the Ferns lead. The same player converted another placed ball on the re-start but succumbed to injury four minutes later. Taghmon-Camross struggled throughout the third quarter though, a point borne out by the fact that their first attempt at a score after the break didn't arrive until the 46th minute when Barry O'Gorman dropped a kick short. Eventually Eoin Doyle narrowed the gap to 5-4 in the 50th minute, but the Ferns cause wasn't helped when linesman Martin Conway alerted referee John Diskin to an off-the-ball incident and Tomás 'Ducker' Hawkins was red-carded. Seamus McLoughlin levelled two minutes later from a free but Taghmon-Camross simply couldn't edge ahead. John Breen restored the Ferns lead from a free before Barry O'Gorman equalised, and there was a let-off for the red and whites 40 seconds into added time when Darren Carty was penalised for over-carrying after it looked like he was fouled first close to goal. The advantage lay with Ferns again when Paul Morris kicked a short free to John Breen who made it 7-6 with a fine finish in the 62nd minute. Stephen O'Gorman was the Taghmon-Camross saviour, pointing from just inside the 45-metre line after an Ian Carty handpass for the last of their five equalisers nearly three and a half minutes into added time, but they still had that late, late scare to endure before the game ended in stalemate. Ferns St. Aidan's: Ivan Meegan; Niall Maguire, Pádraig Bolger (capt. ), Brian O'Neill; Keith Breen, Declan Byrne, Peter Nolan; John Breen (0-2, 1 free), Patrick Breen (0-1); Paul Morris, Tommy Dwyer (0-1), Tomás Hawkins; Ryan Nolan (0-2 frees), Colm Whelan, Jonny Dwyer (0-1). Subs. - Robert Vickers for Nolan, inj. (37), Ciarán Roberts for Maguire (50), Eddie Cullen for Whelan (60). Taghmon-Camross: Seán O'Gorman; David O'Keeffe, Mark O'Gorman, Stephen Stafford; Shane Doyle, Barry O'Gorman (0-1), Pat Nolan; Derek O'Hanlon, Stephen O'Gorman (0-2); Páuric O'Gorman (0-1), Ian Carty, Darren Carty; Pierce Doyle, Seamus McLoughlin (0-1 free), Eoin Doyle (0-2). Subs. - Luke Sinnott for P. Doyle (41), Darren Hayden for O'Hanlon (48). Jason Ryan's Taghmon-Camross team left Innovate Wexford Park with more questions than answers despite claiming an eventual one-point victory over Ferns St. Aidan's in their Ashdown Park/Amber Springs Hotels Intermediate football championship semi-final replay on Saturday. The biggest question of all is whether they are good enough to see off Bannow-Ballymitty in the final, with fresh doubts as to their ability to show consistency over a full 60 minutes. It was during the opening 30 minutes of this replay that they played some of their best football of the championship, leaving them with a four-point interval lead despite the concession of two goals inside the opening six minutes. While Ferns failed to build on that dramatic start, they went on to take control of the opening 20 minutes on the resumption, as point by point they reduced the deficit to dramatically draw level (2-8 to 1-11) with just over two minutes of normal time remaining. They had restricted their opponents to one second-half point up to the 24th minute, a Darren Carty effort, but the south county side finished with two successive points to help them clinch a final spot. Corner-forward Jonny Dwyer availed of slackness in the opposition defence to crash home goals after two and six minutes, with Ian Carty responding in between with a fine point from play. With Stephen O'Gorman, Seamus McLoughlin, Carty and Eoin Doyle all on target the sides were level (0-6 to 2-0) at the end of the opening quarter. There were lots of positives to the eventual winners' play following that disastrous start, with Jason Ryan's imprint all over their approach, and a sweeping move out of midfield three minutes into additional time led to Luke Sinnott finishing clinically with a low ground shot to the net, a score that helped his side to a 1-9 to 2-2 interval lead. There was a dramatic start to the second-half as Ferns pressed forward in the second minute. Taghmon-Camross 'keeper Seán O'Gorman was deemed to have fouled the ball on the ground close to the edge of square, leading to referee Fintan O'Reilly awarding a penalty, but following consultation with his umpire he re-started the game with a throw-in. It was a really dramatic call but the decision seemed to galvanise Ferns, with points through Paul Morris, John Breen and Patrick Breen gradually reducing the deficit, before a Breen pointed free two minutes from the end brought the sides level (1-11 to 2-8). Taghmon-Camross had struggled to break the Ferns wall and were regularly turned over, but Seamus McLoughlin eventually settled his side's nerves with an excellent 59th-minute point which was followed by a huge Luke Sinnott point from an acute angle, giving his side a 1-13 to 2-8 lead. However, Ferns responded with a late surge, resulting in a Paul Morris pointed free, with Taghmon-Camross having to survive a barrage as their opponents sought out a levelling score. Ferns St. Aidan's: Ivan Meegan; Niall Maguire, Pádraig Bolger, Brian O'Neill; Keith Breen, Declan Byrne, Peter Nolan; John Breen (0-4 frees), Patrick Breen (0-1); Paul Morris (0-3, 1 free), Tommy Dwyer, Robert Vickers (0-1); Ryan Nolan, Colm Whelan, Johnny Dwyer (2-0). Subs. - Frank Devereux for Whelan, Eddie Cullen for R. Nolan. Taghmon-Camross: Seán O'Gorman; Mark O'Gorman, Stephen Stafford, David O'Keeffe; Darren Carty (0-1), Pat Nolan, Darren Hayden; Barry O'Gorman, Stephen O'Gorman (0-3); Eoin Doyle (0-1), Ian Carty (0-3), Páuric O'Gorman; Pierce Doyle (0-1), Seamus McLoughlin (0-3, 2 frees), Luke Sinnott (1-1). Subs. - Michael O'Gorman for Doyle, Shane Doyle for Sinnott, Derek O'Hanlon for Hayden (black card, 63).